At the risk of being macabre, I've been having these uneasy passing thoughts about what happens to a person after s/he dies. About ghosts and goosebumps and at what specific moment does someone go from being a person to being just a cold body. Of course I'll never really know for sure until I get there but that seems to egg the pondering on. It is endlessly crazy-making to not be able to put my finger on something; not to have an answer; not to be able to grasp something tangible. Despite the frustration, I'm drawn to these in-between moments and contradictions and things that hover neither here nor there. 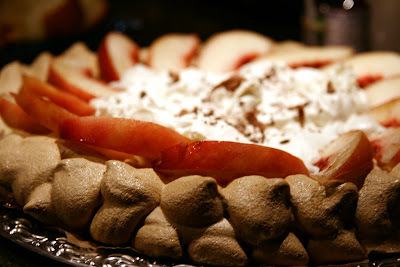 Meringue is one of my favorite desserts and one that I feel is served too rarely. Fortunately I live in a relatively dry climate which helps with meringue--except, as the fates would have it, every time I decide to make meringue the weather turns muggy. Today was no exception. 100° and damp. Anyway, pavlovas are meringue shells that are delicate and crunchy on the outside but retain a marshmallowy core, topped with whipped cream (or the like) and fresh (usually tart) fruit. into buoyancy by whipping in as much air as they can hold. 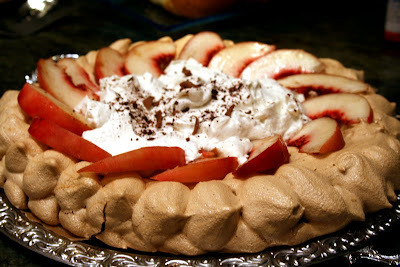 Instead of sticking to the dainty-sweet flavors that often go into meringue, I wanted a contrast--mysterious and deep. Maybe even smoky. I thought of the dark gritty sludge at the end of a Turkish coffee as the possible antithesis to the white clouds of meringue that vanish on a tongue. Of course, a dessert of used coffee grounds is unappetizing so I went with the flavors of Turkish coffee--strong coffee and spicy, exotic, aromatic cardamom. After I long debate with myself, I decided that the coffee would go in the meringue shell and the cardamom would flavor the cream, rather than vice versa. I also considered forgoing fruit and just topping the whole thing off with bitter chocolate...but it is summer. And peaches are very good sprinkled with a little cardamom. So here is my Turkish Coffee Pavlova: Neither/both dark and/or light, strong and/or fragile, bitter and/or sweet, and a total mess to eat. * I have to save the explanation of why you add vinegar for another, more chemistry-oriented time. Preheat oven to 250°F. Trace a 9 " circle on a piece of parchment and place on a baking sheet. Sprinkle sliced peaches with powdered sugar and a pinch of cardamom and let rest in the fridge until you're ready for them. For the meringue: Mix 3/4 C sugar and instant coffee together in a small bowl. Mix 1/4 C sugar, 1/4 tsp cardamom and cornstarch together in another small bowl. In a large metal or glass bowl beat egg whites until they hold soft peaks. Gradually beat in the coffee/sugar mixture until the eggs hold semi-firm peaks. Slowly beat in the sugar/cornstarch mixture until the eggs are very firm. Beat in the vanilla and vinegar, being careful not to over-beat. They should look glossy and stand in stiff peaks. Using either a spoon or a pastry bag, fill the circle with the egg white mixture, building up the edges more than the middle. Bake for about 45 minutes until the outside is dry. Turn off the oven, prop the door open a little and let the meringue cool in the oven for at least an hour. It should be totally cool before filling. For the cream: If you can, chill the beaters and bowl in the freezer. Add 1 C cream, 1 T sugar, 1 tsp cardamom, and 1/2 tsp vanilla to the bowl and beat until light and stiff. Remove the meringue from parchment (carefully!! I didn't do a good job of this part) and place on a serving platter. 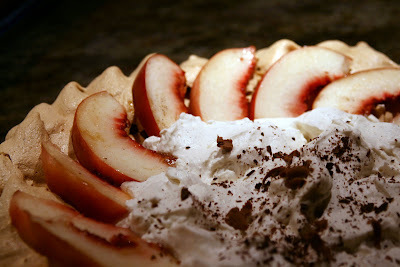 Spoon the cream into the meringue shell, arrange the sliced peaches around the cream and top with shaved chocolate.